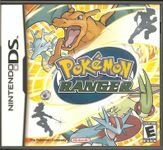 Pokémon Ranger is an action/role-playing video game developed by HAL Laboratory and published by Nintendo for the Nintendo DS video game console. It is set in the Fiore region. The region's name originates from the Italian word for flower. The region itself doesn't appear in the Pokémon anime series, although the female protagonist of Pokémon Ranger, Solana, has made an appearance. The Go-Rock Squad is the resident crime syndicate of this region. Fiore itself doesn't have any native Pokémon, but has many Pokémon from other regions. It also does not have any Pokémon Trainers. All people who live with Pokémon keep them outside of Poké Balls, like pets, as Pokémon are never trained here. Source: Wikipedia, "Pokémon Ranger", available under the CC-BY-SA License.